The Mobile Hydraflo™ mobile pump is a unique variant of the standard Hydraflo™ water pump. It is a complete mobile pump station on wheels that can be quickly moved to where it is needed and will be operational within minutes of arriving. The basic design of the Hydraflo™ with its drive unit connected to the pump head by hydraulic hoses allowed this portable design. No other portable pump will even approach the low to medium head pumping capability of the Mobile Hydraflo. When serious pumping is required after flooding or for high volume drainage jobs, there is no substitute. The portability of the Mobile Hydraflo™ permits easy movement to various locations where large volumes of water need to be pumped. Everything needed for pumping is mounted on an over-the-road trailer. This includes: the diesel engine, water pump, fuel tank, hydraulic oil reservoir, rigid discharge pipe, flexible discharge hose, and a complete safety shutdown system. Mobile Lineshaft and Submersible Electric Pumps are also available. Please see the Mobile Pumps brochure below. The Mobile Hydraflo pump is a unique variant of the standard Hydraflo water pump and it is a complete pump station on wheels. Designed and manufactured by MWI Corporation, the Hydraflo is a submersible axial or mixed flow pump driven by a hydraulic pump and motor through flexible hydraulic lines, instead of a typical long, fixed shaft. This innovative design design allows great flexibility, cost savings and speed in the placement of the pump. Since little to no civil works are required to install the Hydraflo pump system, total project costs can be reduced by up to 70%, and its design allows the pump to become mobile. The portability of the Mobile Hydraflo permits easy movement to various locations where large volumes of water need to be pumped. Everything needed for pumping is mounted on a spring/axle trailer. This includes: the diesel engine, water pump, fuel tank, hydraulic oil reservoir, rigid discharge pipe, 50 feet of flexible discharge hose, and a complete safety shutdown system. The Mobile Hydraflo is self lubricating, t herefore it is capable of running dry for extended periods of time without damage. The unit is simply backed into position. A hydraulic winch lowers and raises the water pump and discharge pipe for ease in loading and unloading. Flexible hoses are used to connect the pump to the diesel-engine-driven hydraulic system. After lowering the water pump to the desired position, the 50 feet of flexible discharge hose is unrolled to the point of discharge. There is no need to prime the pump. Once the diesel engine ois activated, the mobile unit is ready for the pumping operation. MWI Mobile Hydraflo pumps have been used worldwide for agricultural irrigation, storm drainage, de-watering, emergency pumping, and almost any application for moving large volumes of water. For applications where space is limited – like dams, levees, dikes, etc., MWI created the Turntable Mobile Hydralfo. Our engineers developed this model for increased maneauvaerability. The turntable option is highly recommended when reversing pumping locations regularly in a confined space. It is capable of hydraulically raising and lowering the entire unit off the ground, providing 180 degree rotation in either direction. This unit is designed with plumbing that consists of a special hose carrier that feeds the hydraulic oil to the water pump. The water pump can operate at any rotated position without having to disconnect or re-connect the flexible hydraulic hoses. In order to better serve the needs of our customers, MWI created the Mobile Reach. This option allows the pump head of an MWI Mobile Hydraflo to extend as much as an additional 5 meters over our standard unit. Mobile Reach can extend deeper and farther into canals, lakes, and rivers that were previously inaccessible. The pump`s telescopic discharge pipe is also an advantage in locations where water levels vary greatly. By utilizing just one person, and a few simple steps, the pump head can be extended out from the discharge pipe without the need of a crane, tools, or special equipment. An innovative seal arrangement allows the pipes to slide within each other, yet seal at any location. With 10 meters of total reach, this option makes MWI`s Mobile Hydraflo the most versatile pumping station available. MWI offers a Mobile Submersible Electric pump complete with generator and light tower. Sizes range from 8” to 14”. These versatile units can be used to provide mobile generating power or portable lighting or the high volume flows that come only from axial or mixed flow pump for serious water moving. Consult factory for performance and specifications. 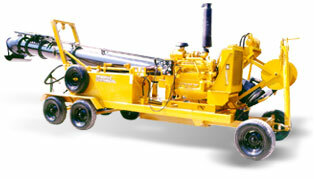 MWI’s Mobile Lineshaft pump is a completely movable pump station on wheels. This low-maintenance Lineshaft pump has a right angle gear drive and is powered by either a diesel engine or an electric motor which would require an external power source. With over 50 years of experience in designing and building mobile pumps, the frame of the Mobile Lineshaft pump has been engineered for smooth operation at all angles. The Lineshaft pump can be oil or water lubricated. It can be operated at several angles without being supported at the bottom. For customers looking for an efficient, movable high volume pump at a cost they can afford, MWI’s Mobile Lineshaft is the answer.